Gloria Araceli Salanic Cornejo is a Maya-K’iché woman whose professional experience includes working as a Volunteer Community Facilitator for Asociación Amigas, where she provided training on family planning, prevention of violence against women, personal relationships, and HIV/STIs in the rural villages surrounding Quetzaltenango. She has a teaching degree and works as a Physical Education teacher. Gloria is the secretary of her Catholic youth group, where she provides talks on communication and attitudes about sexuality. 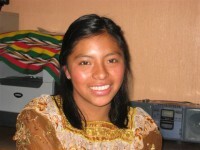 Gloria was 18-years old when she was selected as a GOJoven Fellow. Gloria’s long term plans are to study radiology at the university and, with her mother, open a clinic and pharmacy in her home town.